Albertans are being honoured for their work to preserve and share the stories of our province at the 2018 Alberta Historical Resources Foundation Heritage Awards. 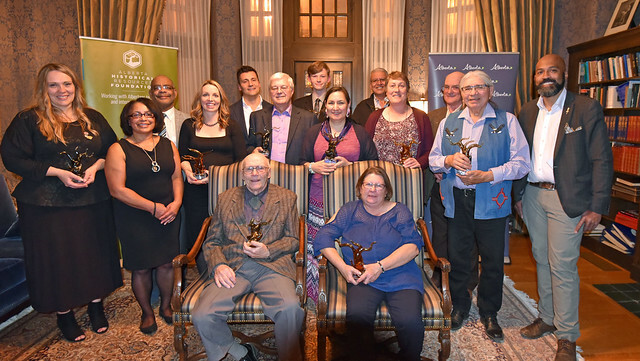 David Shepherd, MLA for Edmonton-Centre, (far right) joined in honouring recipients of the 2018 Alberta Historical Resources Foundation Heritage Awards at Government House. The biennial awards honour the contributions of individuals, organizations, businesses, Indigenous communities and municipalities engaged in heritage preservation and appreciation in the following categories: Outstanding Achievement, Heritage Conservation, Heritage Awareness, Indigenous Heritage and Youth Heritage. Additional information on the 2018 award recipients is available on the Alberta Historical Resources Foundation Heritage Awards web page. The awards program is an integral part of the Government of Alberta’s commitment to supporting heritage preservation efforts in communities throughout Alberta. A total of 70 awards have been presented to recipients from across the province since the program was reintroduced in 2005.